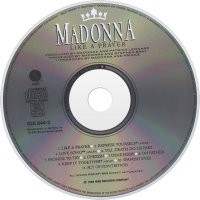 Like a Prayer is the fourth studio album by American singer-songwriter Madonna, released on March 21, 1989 by Sire Records, three years after her previous studio album. Madonna worked with Stephen Bray, Patrick Leonard, and fellow icon Prince on the album while co-writing and co-producing all the songs. 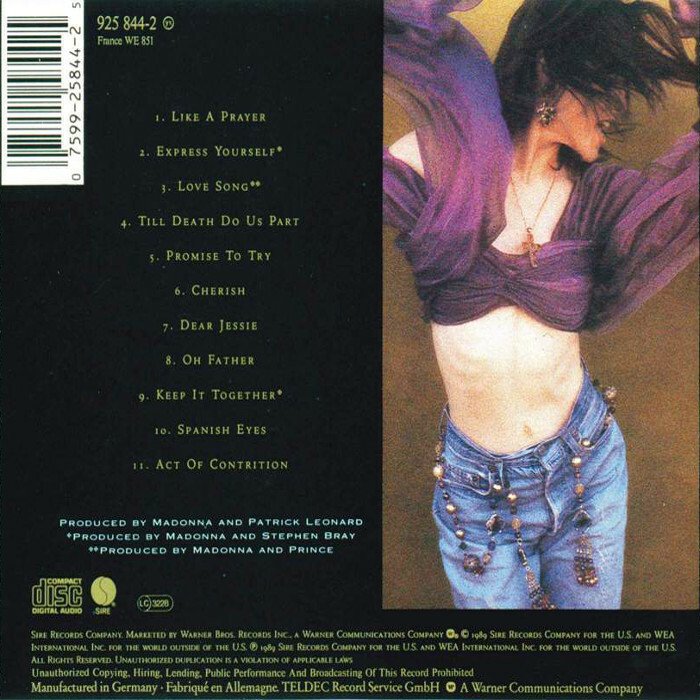 As Madonna's most introspective release at the time, Like a Prayer has been described as a confessional record. She described the album as a collection of songs "about my mother, my father, and bonds with my family." The album was dedicated to her mother, who died when Madonna was young. The album uses live instrumentation and incorporates elements of dance, funk, gospel, and soul into a more general pop style. Madonna drew from her Catholic upbringing, as seen in the album's title track and lead single "Like a Prayer". The lyrics deals with themes from Madonna's childhood and adolescence, such as the death of her mother in "Promise to Try", the importance of family in "Keep It Together", and her relationship with her father in "Oh Father". Madonna also preaches female empowerment in "Express Yourself". Upon its release, Like a Prayer was mostly praised by music critics. Rolling Stone hailed it as "...as close to art as pop music gets." Commercially, Like a Prayer became an international success like its predecessors, reaching the top of the charts in multiple territories. The album was certified quadruple platinum in the United States by the Recording Industry Association of America. 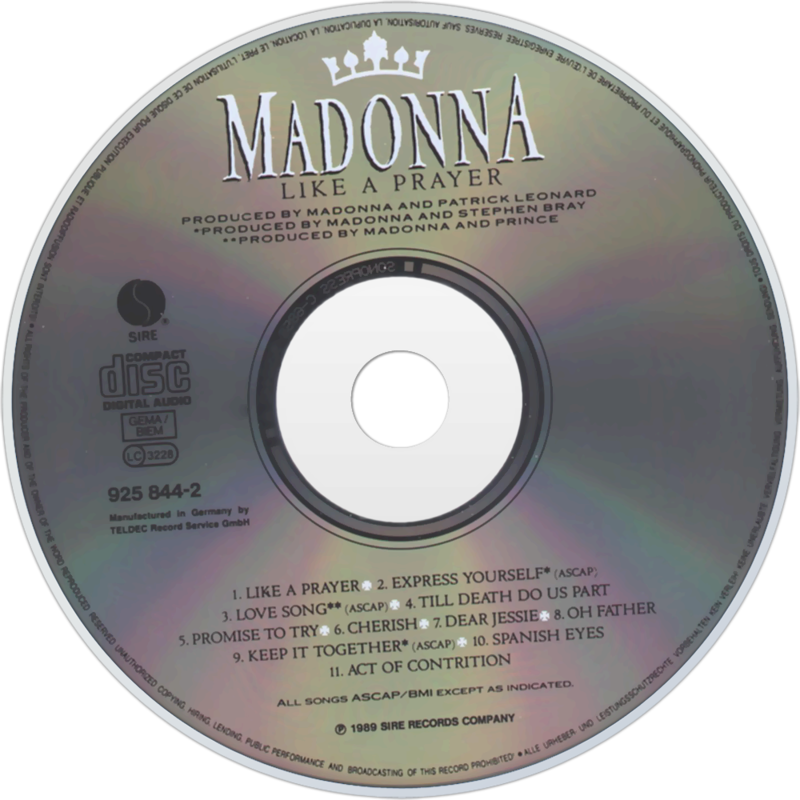 Six singles were released from the album: "Like a Prayer", "Express Yourself", "Cherish", "Oh Father", "Dear Jessie", and "Keep It Together". "Like a Prayer" became Madonna's seventh number-one on the Billboard Hot 100, while "Express Yourself" and "Cherish" peaked at number-two. Worldwide the album has sold over 15 million copies. With the singles' accompanying music videos, Madonna furthered her creativity and became known as a leading figure in the format. The music video for "Like a Prayer" was a lightning rod for religious controversy, using Catholic iconography such as stigmata and burning crosses, and a dream about making love to a saint, leading the Vatican to condemn the video and causing Pepsi to cancel Madonna's sponsorship contract. "Express Yourself" was the most expensive music video ever made at the time. The album preceded Madonna's ground-breaking Blond Ambition World Tour. At the end of the 1980s, following the release of Like a Prayer, Madonna was named as the "Artist of the Decade" by media such as Billboard, MTV, and Musician magazine.